From: Cervantes: Bulletin of the Cervantes Society of America 10.1 (1990): 109-20. ITH few exceptions, critics continue to claim that Persiles is a romance devoid of humor or irony. In opposition to these evaluations of Persiles, I contend that the metafictional discourse of the narrative serves to distance the reader from the fictive world in order to create a sense of aesthetic detachment from the text, a feature that distinguishes the work from romance. A brief consideration of narrative authority will elucidate the extensive manipulation of literary conventions that pervades all aspects of the work and how, within this framework, the text's self-conscious humor ironically underscores the metafictional foregrounding of narrative technique. Thus, the work's metafictional nature precludes its interpretation as straightforward romance. identities as siblings. Large portions of the texts consist of speeches by the characters relevant or otherwise on various philosophical, political and scientific topics including fate, omens and human passions (Dialogic, 88-9). The superficiality of the coincidences between the Byzantine Romance and Persiles becomes clear when considered in light of the theoretical distinction between story and discourse. Russian formalism proffered the terms fabula and syuzhet to identify these components of narrative, concepts that were further developed by French Structuralism as histoire and récit. Seymour Chatman's study of narrative structure builds upon these same principles. For Chatman, story consists of narrative content (the event, characters and setting) whereas discourse refers to narrative expression. Although many elements of Persiles' story (the lovers, their travels and the obstacles they overcome) appear identical to those of the Byzantine romance, the self-conscious manipulation of their presentation in the Cervantine discourse transcends a merely imitative relationship. Proponents of the dominant evaluation of the text as a straightforward imitation of Byzantine romance often cite Cervantes' assessment of the work as a libro que se atreve a competir con Heliodoro to support their position. The interpretation proposed here would cast this phrase in a different light: as a metafictional rendering of the Byzantine romance in general and of Heliodorus' Aethiopica in particular, Persiles dares to challenge the conventions of the targeted genre in much the same way that Don Quijote challenges the chivalric model. Essentially, metafiction represents itself as a self-conscious art form by exposing accepted conventions in a manner that challenges generally held conceptions of truth and reality. Thus, metafictional or self-conscious elements, by their very nature, force the audience to re-examine basic assumptions originally accepted as natural. In fact, Persiles fits Hutcheon's definition of metafiction in which, through a process similar to the Formalists' Ostraneniye or Brecht's Verfremdung, the laying bare of literary devices brings to the reader's attention those formal elements of which, through over-familiarization, he has become unaware (Narcissistic, 24). The private narrators would be followed by the public or extradiegetic narrators who address an audience outside the fictional world. Theoretically, a public narrator enjoys an author's relationship to the discourse act he defines for the reader the story world in which he will function as creator and authority (Lanser, 138). A given work may have more than one public narrator, but when this occurs, one of them usually fulfills the role of an editor. In Persiles there are two public narrators an authorial narrator and an editorial one. Each narrator's status and stance remain consistent and, therefore, their voices can be distinguished. Nevertheless, even when the words are those of the authorial narrator, they may have been filtered by the editorial figure. In this sense, because the editorial narrator controls the words of the authorial one, the latter has become the subordinate of the former. Ruth El Saffar describes this same occurrence in Distance and Control in Don Quixote: the controllers become the controlled when they fail to maintain the necessary distance from the fictional world. Thus, the authorial narrator controls the characters but is controlled by the editorial narrator who holds a higher position in the chain of authority. Above the editorial narrator lies the extrafictional voice, present in the title and chapter headings, that conventionally serves as the ultimate textual authority. The sole importance of the extrafictional voice does not stem from the information it provides for the formulation of an implied author. In fact, all other voices that the text creates are subordinate to it (Lanser, 128). Undeniably, the extrafictional voice operates on a different level from the other textual voices. Paréceme que si no se arrimara la paciencia al gusto que tenían Arnaldo y Policarpo de mirar a Auristela, y Sinforosa de ver a Periandro, ya la hubieran perdido escuchando su larga plática, de quien juzgaron Mauricio y Ladislao que había sido algo larga y traída no muy a propósito . . . (217). Scarcely three pages later, the extrafictional voice proclaims in the chapter heading: Prosigue Periandro su agradable historia . . . (221). The blatant contradiction between the two levels ironically undermines the concept of narrative reliability. Just as the act of reading is emphasized throughout Don Quixote, the act of narration is dramatized repeatedly throughout Persiles. Forcione's examination of the presentation of artistic creativity demonstrates that the process of creation pervades the work. In this respect, Antonio's account of his life, Periandro's narration of his heroic deeds, the counterfeit captives' tale of woe and Isabela Castrucha's elaborately staged drama all constitute reflections upon the weaving of fiction. That Forcione identifies the discussion of literary theory itself as one of the major themes of Persiles indicates the metafictional nature of the narrative. It seems to be an oft-cited commonplace of contemporary metafictional theory that only in the twentieth century does the emphasis shift from unmasking the conventions to foregrounding the process of creating fiction (Spires, 16). Persiles seems to challenge this interpretation for the text often focuses on the process of narration itself. In this manner, the discourse foregrounds the preoccupation with literary creation. It constantly reminds the reader that the work is not real but rather presents an artificially constructed fiction. Several critics believe that the play with narrative voice and generic conventions is limited to, or at best, most prevalent in Book II. Periandro's lengthy narration of his heroic deeds and the critical commentary it elicits regarding unity and verisimilitude indeed encapsulate a wide variety of metafictional devices; however, the same techniques can be found throughout the text. Pues, quién eres? preguntó la persona que hablaba . . . (I, 2:56). Aquí llegaba de su historia el español gallardo, cuando llegó el que había ido a saber lo que en la isla pasaba (I, 6: 81). Que tal vez dijo el uno, digo, el que hablaba más que el otro . . . (III, 11: 350). These lines will sound very familiar to cervantistas, for as Weiger demonstrates, the author manipulates the identification of characters in many of his works (190). The first passage's tautological identification of the speaker violates a basic narrative convention the precise identification of the character speaking. At the same time, it reveals the superfluous nature of such identification, for a reader usually knows the identity of the character speaking from the logical sequence of the dialogue. In the second excerpt, however, the name of él que había ido . . . is not evident. Therefore, the text forces the reader to review past information much as the narrative voice of Tristram Shandy encourages the confused reader to reread previous pages to clarify any misunderstandings. The third example extends the metafictional play by parenthetically introducing the narrator's own voice. Various passages challenge the operations carried out by an omniscient narrator. Perhaps the most salient example involves the repeated use of the verb saber in Book III, Chapter 17: Volviéronse los peregrinos al suyo, quedó ella sola y pensativa, y no sé como se supo que había hablado a solas estas o semejantes razones (388). Although, as the text acknowledges, it is impossible for anyone to know the words that an individual utters when alone, the authorial narrator proceeds to disclose Ruperta's monologue. Furthermore, the expression estas o semejantes razones humorously manifests the narrator's freedom to manipulate the discourse. The self-conscious nature of this paradox graphically represents the problematic ontological status of narrative. En resolución, el volcar de la nave y la certeza de la muerte de los que en ella iban puso las razones referidas en la pluma del autor desta grande y lastimosa historia y ansimismo puso las que se oirán en el siguiente capítulo. The editorial narrator intervenes to comment on the act of narration performed by the authorial narrator. The reader, who may have been drawn closer to the text by the first part, is again distanced by the second. But on the shore every place was ful of men, some quite dead, some halfe dead, some whose bodies yet panted . . . But there could be seene no signes or tokens of any just quarell, but there seemed to be an ill and unluckie banket . . . (20). Entre estas flechas, entre estas heridas, entre estos golpes y entre estas muertes, estaban juntos la antigua Cloelia, la doncella intérprete, Periandro y Auristela . . . Y así, pisando muertos y hollando armas, siguieron al joven bárbaro que les guiaba . . . Desta manera cayendo y levantando, como decirse suele, llegaron a la marina (68-69). The exaggerated presentation of a nightmarish scene contrasts with the characters' lack of concern for others: the image of the heroes stepping on cadavers and treading upon weapons follows the description of the body-strewn battlefield. Their indifference to the scene they witness, combined with the introduction of the phrase como decirse suele, distances the reader from the fictive world. When presented in this way, one cannot grieve for the wounded, but rather is forced to recognize the absurdity of the situation. This effect would be impossible if the reader were not removed from the story by the signs present in the passage as well as by the self-conscious intrusions throughout the work. In his insightful study of Persiles' relation to neo-Aristotelian aesthetics, Forcione briefly refers to the parenthetical phrase como decirse suele as an example of Verfremdungseffekt. He states that such interpolations embody the contemplation of the tension between the realms of actuality and the fantastic (186n); yet, he does not explore their significance to the interpretation of the work as a whole. Bien nos lo muestra esta historia, cuyos acontecimientos nos cortan su hilo, poniéndonos en duda dónde será bien anudarle . . . (342). Y lo que en él les sucedió, nuevo estilo y nuevo capítulo pide (381). the fact that the narrators arbitrarily choose where to end any given episode. In addition, the conclusion of a story may coincide with the death of the teller as in the episode of the portugués enamorado. This ironic association brings to mind Ginés de Pasamonte's conviction that his autobiography cannot yet be completed: ¿Cómo puede estar acabado . . . si aún no está acabada mi vida? (Quijote, I, 209). The association of death with the end of a story receives slightly different treatment in Book I, Chapter 6. When Cloelia, Auristela's companion, dies, Antonio pauses in his narration to state: Venid, señores, y daremos sepultura a la difunta y fin a mi comenzada historia (79). This phrase juxtaposes his total lack of concern for the dead woman with his desire to conclude his tale. Llegaron a ella, y hallaron ser de tal talle, que nos obliga a describirle: la edad, al parecer, salía de los términos de la mocedad y tocaba en las márgenes de la vejez; el rostro daba en rostro, porque la vista de un lince no alcanzara a verle las narices, porque no las tenía sino tan chatas y llanas, que con unas pinzas no le pudieran asir una brizna dellas; los ojos les hacían sombra, . . . (313). intrusions, attempting to explain the improbable happenings, heighten the humorous nature of the passages.
. . . a quien el cielo socorrió con la anchura de sus vestidos, o por mejor decir, con la acostumbrada misericordia de Dios, que mira por los inocentes (378). The humor of the visually comic scene of a woman falling from a high tower, saved by the parachute-like action of her skirts, is increased by the denial that her salvation constitutes a miracle. If it were a miracle, it would necessarily be sacred and therefore not cause for laughter. Moreover, the ensuing attempts to qualify the nature of the happening equate the width of her skirts with God's mercy! This humorous manipulation of a marvelous episode also serves a very serious purpose it underscores the artificial nature of artistic invention. Because of the limited scope of this article, I cannot possibly provide an exhaustive analysis of all the metafictional elements of Persiles. Nonetheless, I believe I have indicated, in part, how Cervantes employs metafictional discourse to distance the reader from the story. The continual violations of narrative norms marks the text as a work of metafiction that exposes accepted conventions in order to challenge generally held conceptions of truth and reality. For, as many thinkers have realized, in showing us how literary fiction creates its imaginary worlds, metafiction helps us to understand how the reality we live day to day is similarly constructed, similarly written (Waugh, 18). In this sense, the scope of the Persiles extends beyond that of romance. If, as Hutcheon contends, metafictional narrative represents the hallmark of post-modernist literary creation, reflective of one of our time's greatest philosophical preoccupations, then perhaps current interest in metafiction will help lead to the recognition of Persiles as an integral part of Cervantes' canon, as the masterwork he proclaimed it to be rather than an anomaly. Bakhtin, Mikhail. The Dialogic Imagination. Trans. Caryl Emerson and Michael Holquist. Ed. Michael Holquist. Austin: U of Texas P, 1981. Cervantes Saavedra, Miguel de. Don Quijote de la Mancha. Ed. Martín de Riquer. Barcelona: Juventud, 1971. . Los trabajos de Persiles y Sigismunda. Ed. Juan Bautista Avalle-Arce. Madrid: Clásicos Castalia, 1969. El Saffar, Ruth. Distance and Control in Don Quixote: A Study in Narrative Technique. Chapel Hill: U of North Carolina P, 1977. . 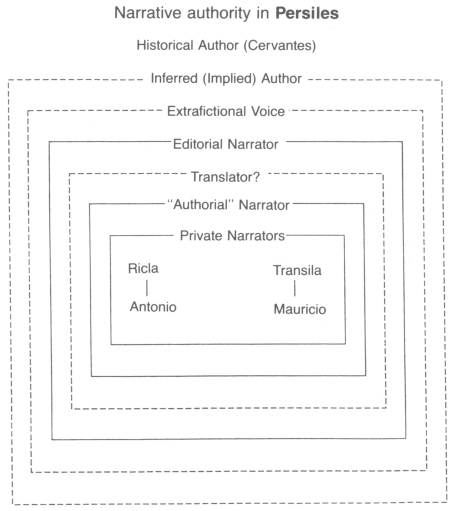 Novel to Romance: A Study of Cervantes' Novelas Ejemplares. Baltimore: Johns Hopkins, 1974. Forcione, Alban K. Cervantes, Aristotle and the Persiles. Princeton: Princeton UP, 1970. . Cervantes' Christian Romance: A Study of Persiles and Sigismunda. Princeton: Princeton UP, 1972. Hutcheon, Linda. Narcissistic Narrative: The Metafictional Paradox. New York: Methuen, 1985. Lanser, Susan Snaider. The Narrative Act: Point of View in Prose Fiction. Princeton: Princeton UP, 1981. Spires, Robert C. Beyond the Metafictional Mode: Directions in the Modern Spanish Novel. Lexington: U of Kentucky, 1984. Waugh, Patricia. Metafiction: The Theory and Practice of Self-Conscious Fiction. New York: Methuen, 1984. Willet, John, trans. Brecht on Theatre: The Development of an Aesthetic. New York: Hill and Wang, 1964. Zimic, Stanislav. El Persiles como crítica de la novela bizantina. Acta neophilologica 3 (1970): 49-64. . Cervantes, lector de Aquiles Tacio y de Alonso Núñez de Reinoso. Diss. Duke U, 1964.